Ragnarok Odyssey: EU release date Feb 20, 2013; DLC now available from NA Vita Store; Sharing Cards!!! 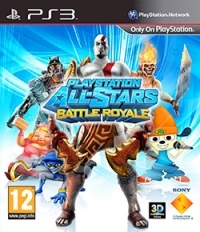 Is PS All Stars going to be a huge flop in America? (dismal pre-orders) UPDATE: Yep, it's a huge flop. Who is NOT Buying WiiU? And Why? Tekken Tag 2 tomorrow, who's getting it? Who wants to play? I'm a Sony fanboy, but should I buy a 3DS?